Hey guys, a small heads up here for an event that’s currently going on, called Get Yourself Speedrunning! 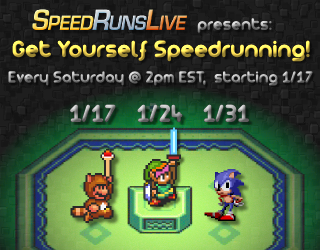 Some of you may know that I’m a fan of speedruns, and SpeedRunsLive decided to hold an event right after Awesome Games Done Quick 2015 (which is an awesome speedrunning marathon hosted for charity), so that people interested in speedrunning have a chance to participate in such a race themselves. Of course, I’m already somewhat familiar with speedrunning since I used to join in blind races where you try to finish the game as fast as possible with no knowledge of the game whatsoever. And I’ve also done some Pokemon runs. And something called the Mystery Tournament, but I’ll talk more about that further ahead in my update. So the last two weekends, there were 2 massive races that broke every record of the amount of participants ever to join in a race. The first one was an any% warpless race of Super Mario Bros 3, where the All-Stars version was also allowed to be played. Too bad I was not really up-to-date with this event at the time, or else I would have joined as well, but alas. The one I did join, however, was the race until Master Sword of one of my favourite SNES games, The Legend of Zelda: A Link to the Past. You can see the (horrible) results in the YouTube video above. As always, these videos are only VODs that were originally streamed through Twitch, so be sure to follow me if you’re interested in such (blind) races. Although I might also play other games and read/translate some Japanese in the mean time. The race had a total of 301 active participants, with 290 people reaching the finish over a time span from 22:01 minutes up to four and half hours. I tried my best but I ended up with double the amount of time needed compared to the first place; 42:53 for my sad 231st place. You can see all the results here. Now, the next and final race is going to be Sonic 2 any%, but sadly I will probably not join this one since I’m not really a fan of the Sonic games. But I do recommend people to check it out if you’ve never experienced speedrunning before. Especially with Sonic; he’s an expert at running fast. The only thing you need is an account on SpeedRunsLive and a Twitch account. I guess you also need some recording equipment but stuff like OBS will help you quite a bit. Remember, it starts without delay on this Saturday, 2PM EST / 8PM CET, so don’t be late! You just have to be in the main channel when looking for the race. Meanwhile, I will share another video though, this time it’s my blind race of Star Guard. The SRL Mystery Game Tournament is an event in which players will participate in a series of matches, racing against a single opponent per round in short to medium length goals. These goals will be for games that are not revealed to them until moments before the race actually begins, giving them enough time to download the game but preventing them from practicing at all. Players are likely to encounter games they’ve played before, seen before, or may have never even heard of. This event is designed to determine not just who has the most gaming experience, but the best overall racing abilities. To sign up for this, you need, once again, a SpeedRunsLive account since it’s an SRL event to begin with. But it gets a bit tricky here, because you also need to submit games with short goals. Don’t think of the obvious ones, such as Super Mario World, but the more obscure retro games that you might have played before. Of course, there’s also the idea of roaming through all the NES and SNES games out there. At least I already have 1 idea for a game, but I might be searching though haystacks for some needles for the other submissions. I might stream my adventure in search for those games on Twitch, so you might get one step ahead if you watch that, haha! This entry was posted in Games and tagged gaming, get yourself speedrunning, mt6, mystery, race, srl, stream, twitch by Chrouya. Bookmark the permalink.